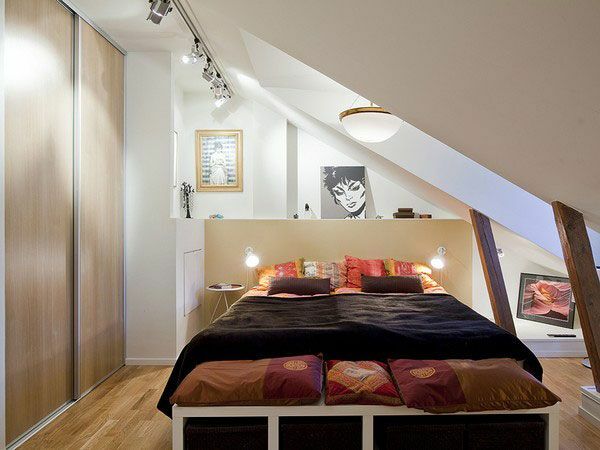 Interesting ideas and practical solutions for small bedrooms. If you need a push to inspire you to, get ready to see a lot of witty and original ideas. 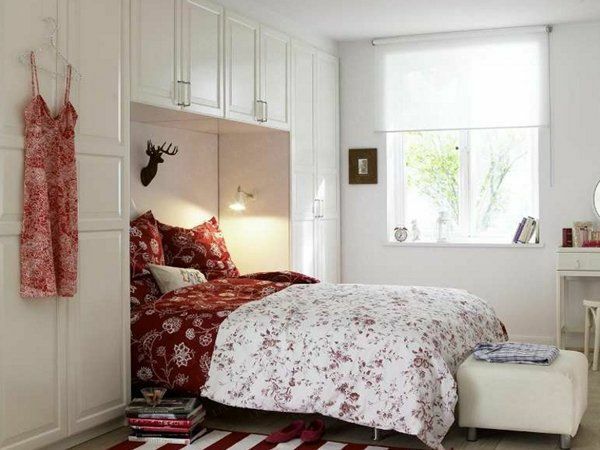 This amazing publication will turn upside down your idea of ​​how to organize a bedroom space. All the achievements of modern design at your service. 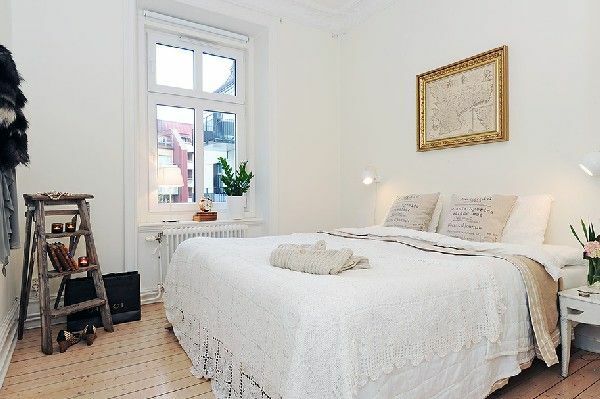 Would you like a Swedish-style bedroom or an ocean-facing room for a vacation? There are suitable solutions for anyone, even the smallest house. 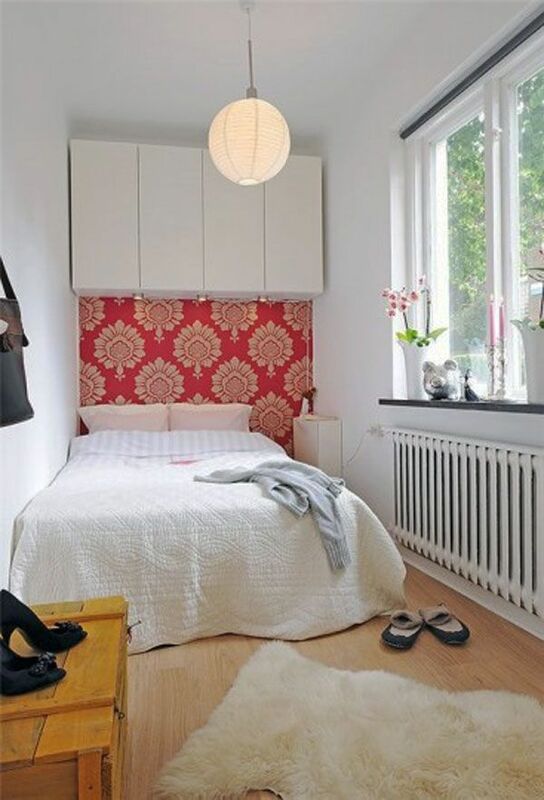 We have selected for you 30 photos of the interiors of small bedrooms with very interesting and reasonable finds of designers. 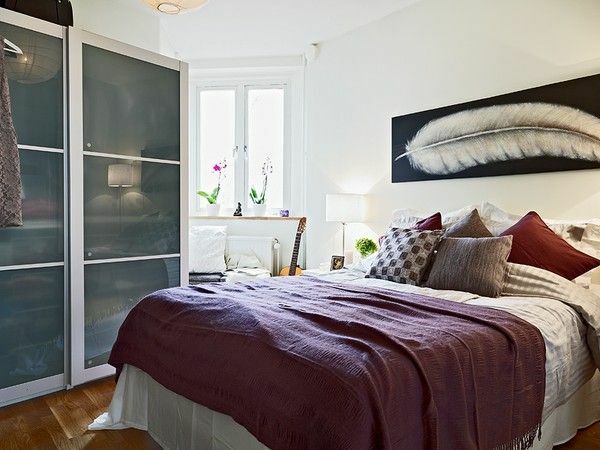 So, sit back and get ready to carefully examine each photo, paying attention to the details and mentally presenting the bedroom of your dreams. 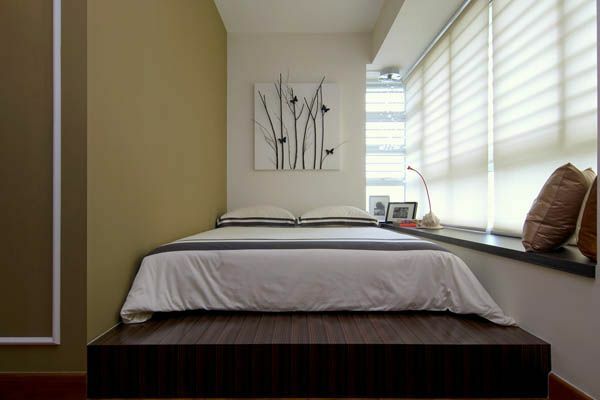 Remember that light colors and shades make the room more spacious. 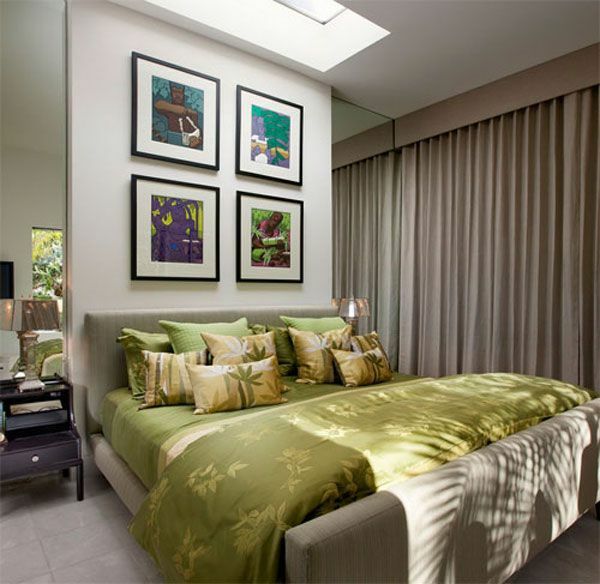 The large bed of immense sizes that you have always dreamed of will take too much precious space. 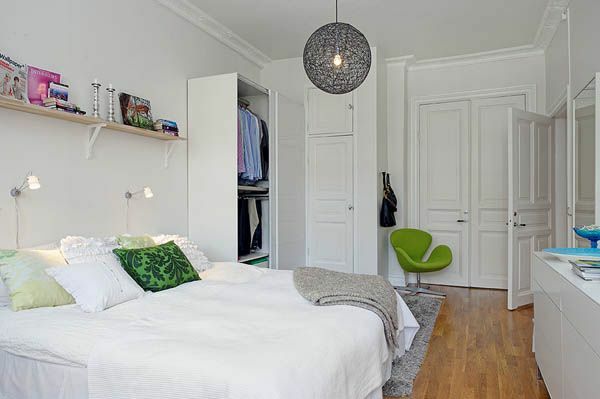 It may be worthwhile to put a smaller bed, but add other pieces of furniture. And more mirrors! They visually enlarge the room. As already mentioned, we invite you to a feast.design ideas, fireworks of colors and textures. 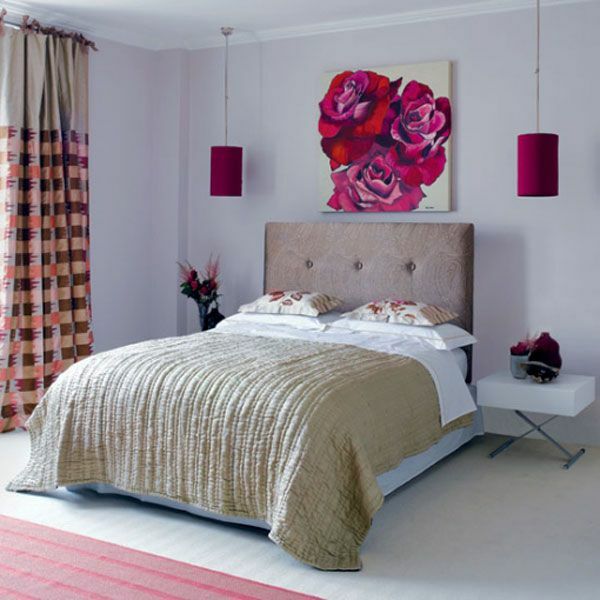 Enjoy planning changes in your bedroom, make it cozy and comfortable to the maximum. And by all means glance to us after some time and tell us what you did. The transparent doors of the cabinets and the white color reigning in the room make the room significantly larger. And here is very well used built-in furniture. 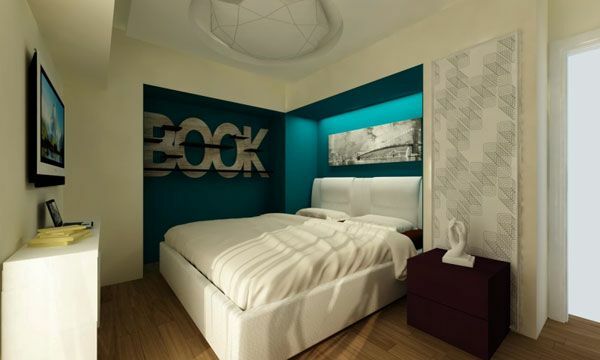 The headboard of the bed with light is in the recess. Again, white dominates. 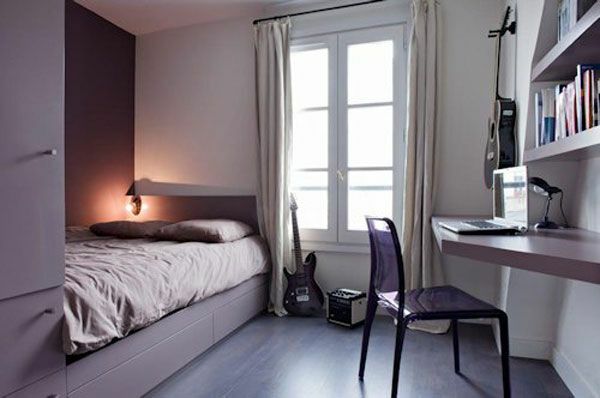 The non-standard form of the room allows you to put the bed diagonally to the window and play with the volumes. The painting with the image of the pen enhances the impression of lightness and airiness. 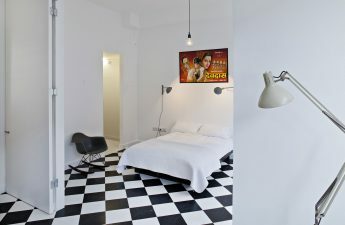 The color scheme of the room is built on the contrast of white and black. Strict lines and original parts. 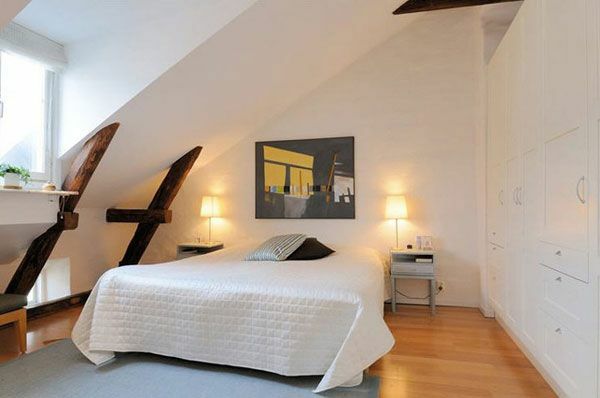 And here is an example of a mansard room decorated in country style. Pop art reigns here. 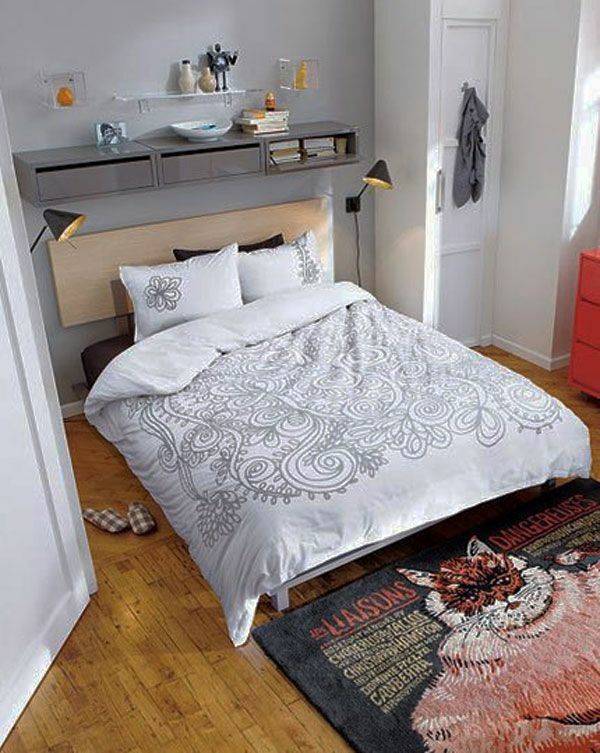 Bright details attract the eye, making you forget about the small size of the bedroom. A bit like a kaleidoscope, don't you find? Inconvenient space with many corners becomes very habitable. Pay attention to the laconic color solution in natural colors. A wall covered with floral wallpaper looks like a window into the garden at sunset. 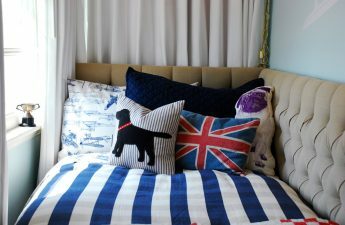 The bedroom becomes cozier and warmer. A lamp in the form of a ball under the ceiling maintains this illusion. Classic "Grandma" option with a charming hand-made coverlet. A great choice for romantic people. 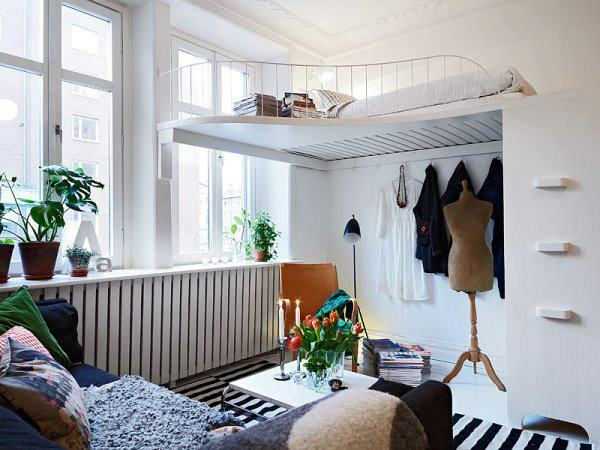 And here the height of the ceiling allowed to place a bed on the mezzanine, significantly freeing up space. Pay attention to the almost invisible stairs. 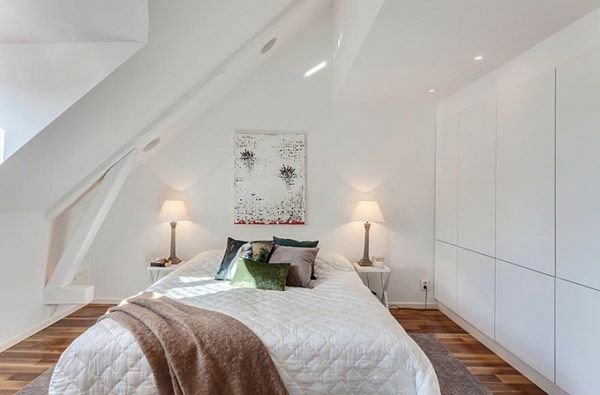 Another attic. 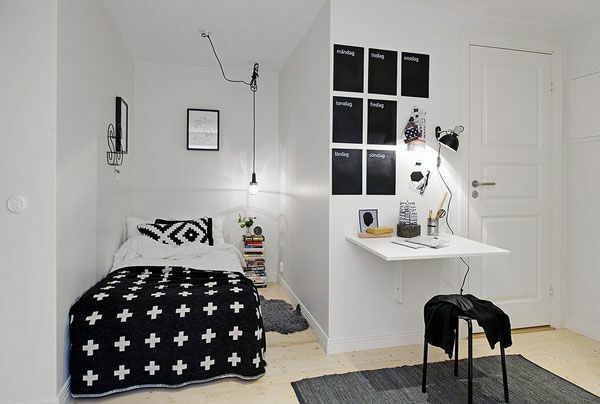 Here they managed to arrange not only a bedroom, but also an office. Workplace by the window and convenient shelves for books. 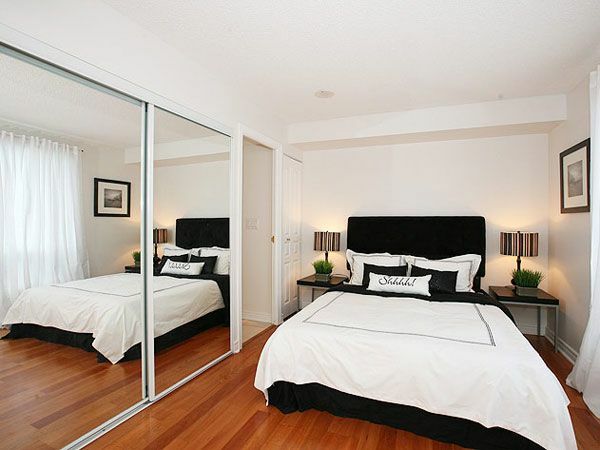 Mirrors located opposite the window, double the space. Elegant black and white gamma gives chic. 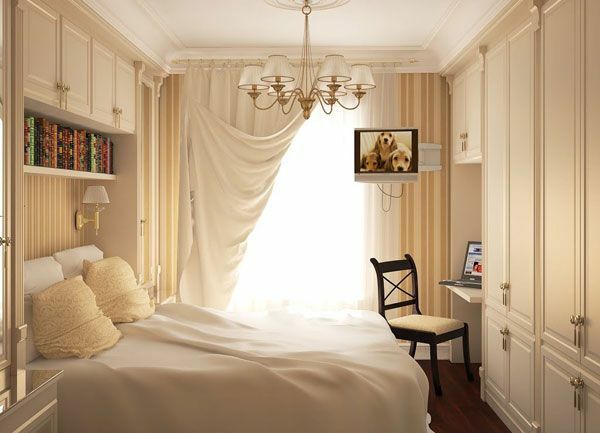 The rough texture of the walls is in harmony with the thick curtains of natural fabrics. Restrained colors do not distract attention from details. A bit of eclecticism. 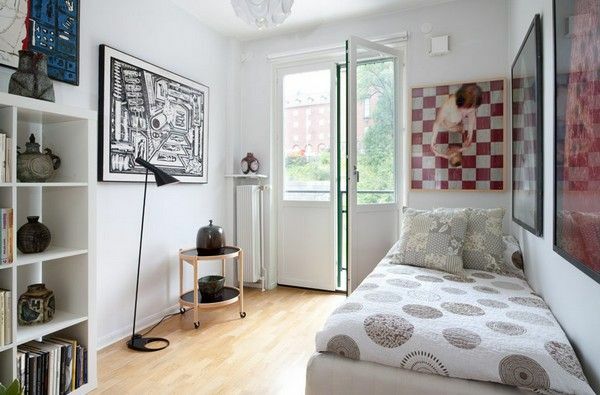 The room is decorated with bright accessories - a carpet with an unusual print, figures in glass cubes. 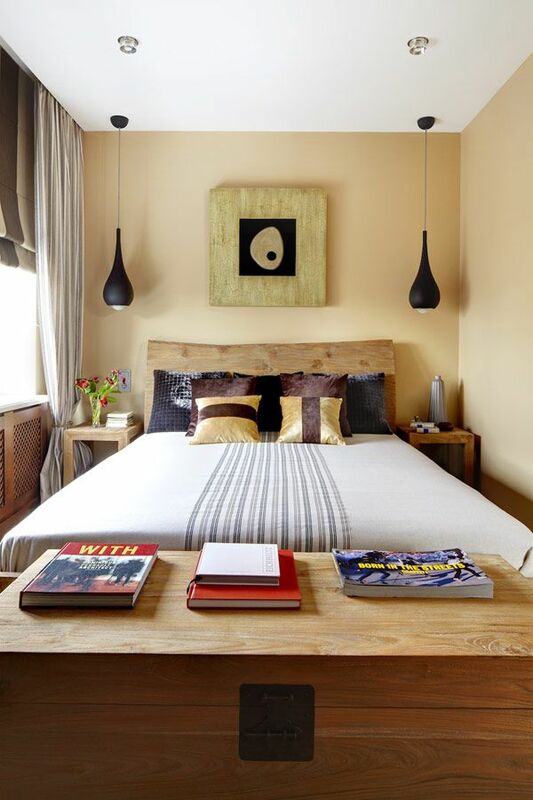 A shelf above the headboard saves space. It is interesting to solve the problem of storage. 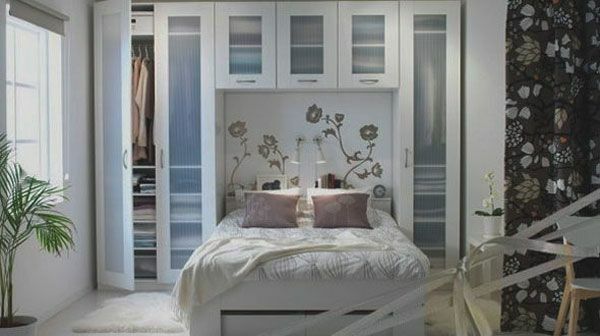 The usual wardrobe and drawers under the bed allow you to place a lot of necessary things. 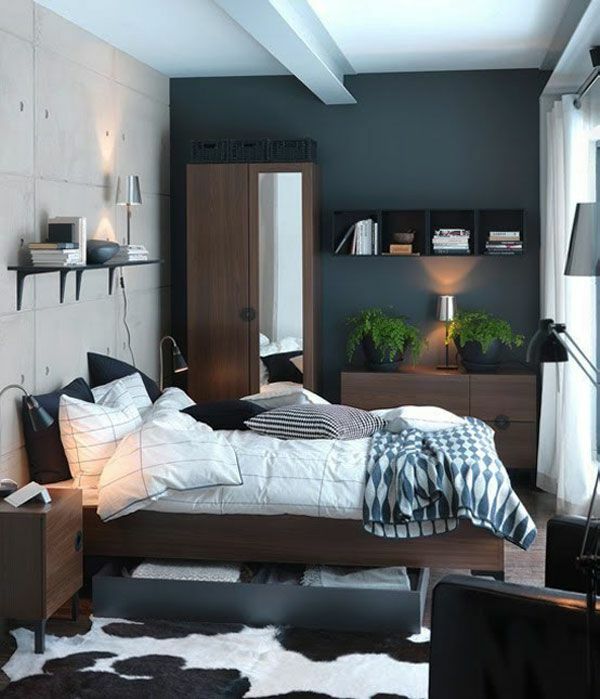 Cozy bedroom for one person. Immediately clear what are the passions of the owner. On a small square there is a whole collection of ceramics. 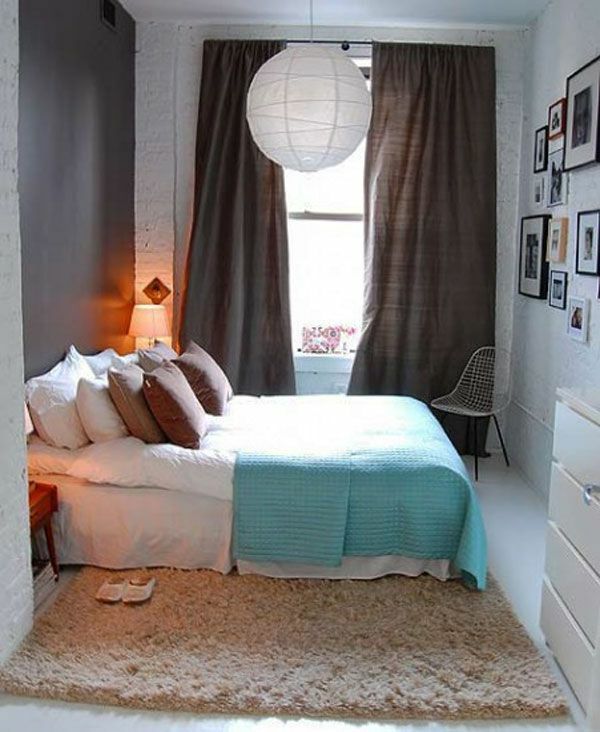 An interesting color scheme distracts from the cramping, although only the most necessary is present in the bedroom. Focus on red. Like a bonfire in the snow. Pay attention to the convenient cabinets and shelves. Classic interior. Mirror wall pushes space. 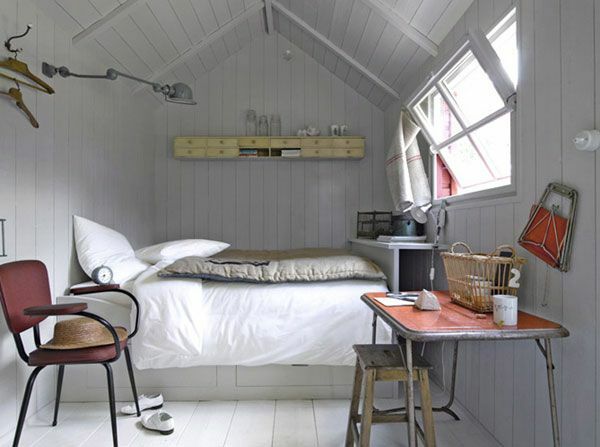 Cozy mini bedroom for lovers of ecological style. And here a curtsy for connoisseurs of palace interiors. 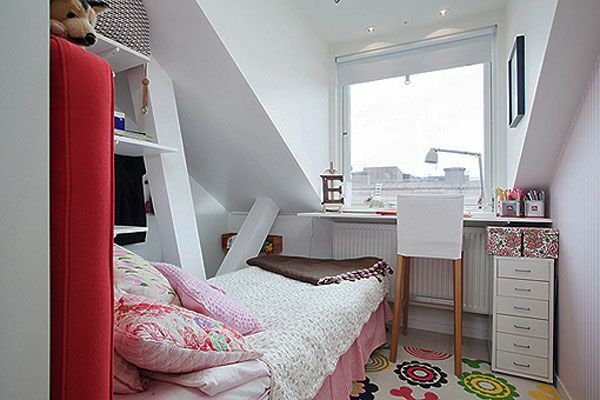 It is possible and in a small room to feel like a little princess. Minimalism in action. 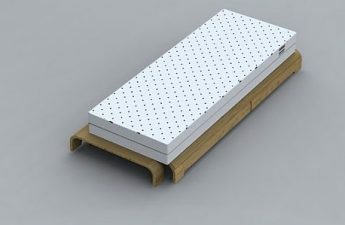 A comfortable mattress bed stretches from wall to wall. 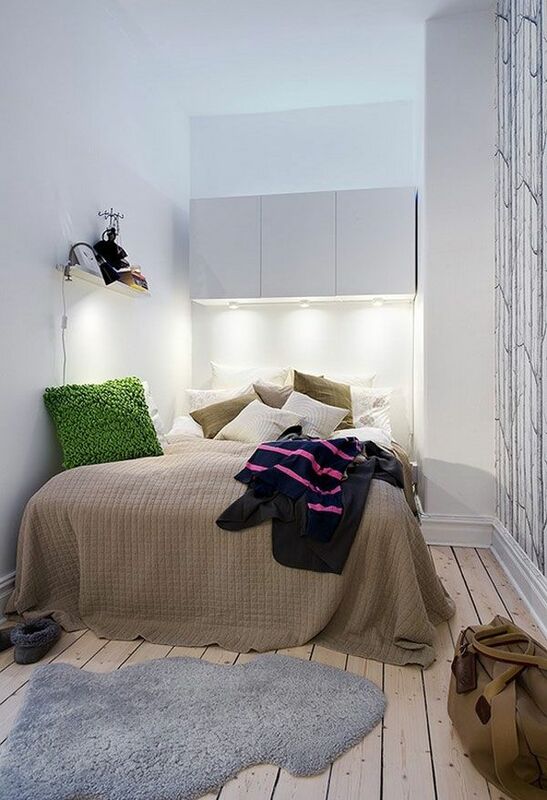 Built-in bed allows you to free up space for a hobby. In a niche fit shelves and a desk. Obviously the influence of the east. 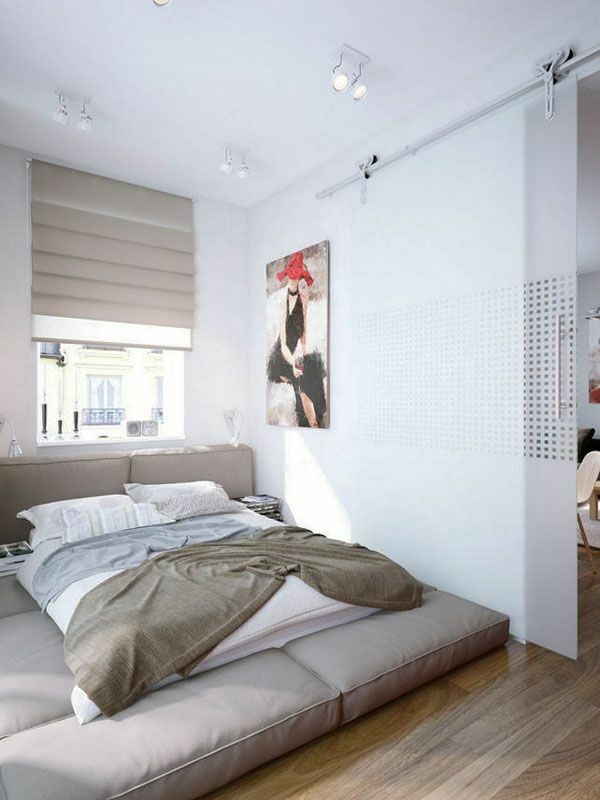 A collage on the wall and translucent curtains reinforce the impression. 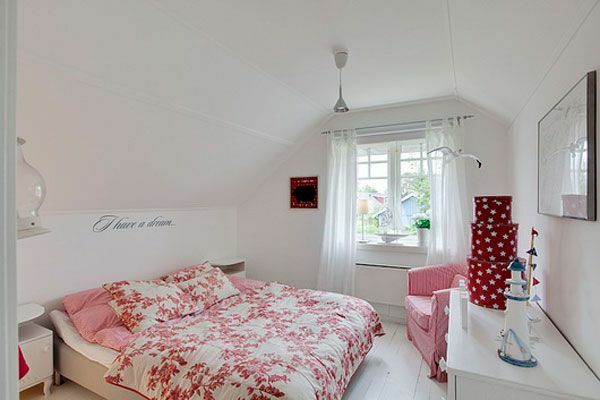 Cozy bedroom in the attic. The built-in sectional cabinet is the only storage place. 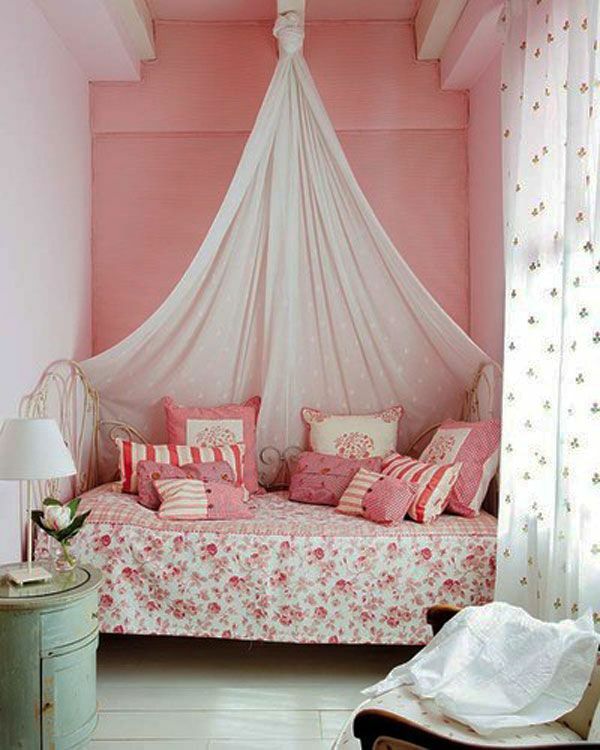 A lot of pillows, canopy and furniture in the style of chebbi-chic. The distant wall, painted in pink, makes the space more voluminous. 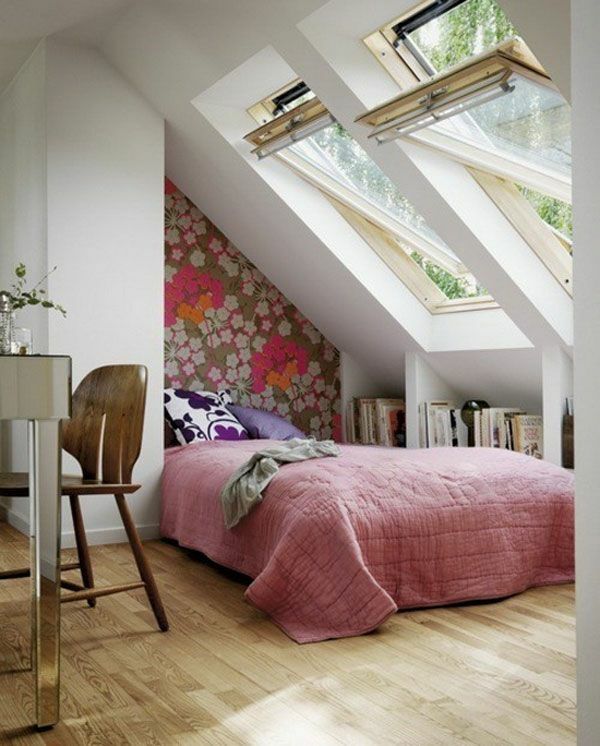 Open attic windows let the garden into the bedroom. 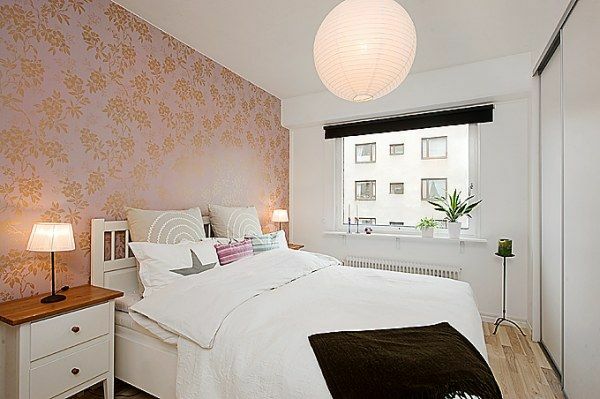 To enhance the impression - wallpaper with a floral pattern over the head of the bed. Original shelves allow you to use the space under the window. 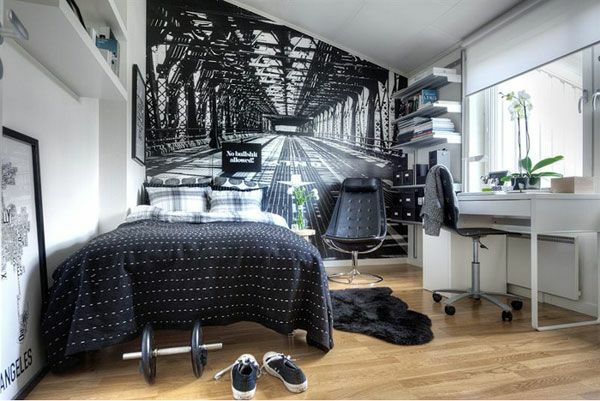 Industrial motifs in the decoration of the bedroom bachelor. Wall murals create an interesting perspective, distracting the eye. Original lamps do not take place on the bedside table. The slope of the roof is accentuated by dark wood decorative beams, which effectively stand out against the white walls. 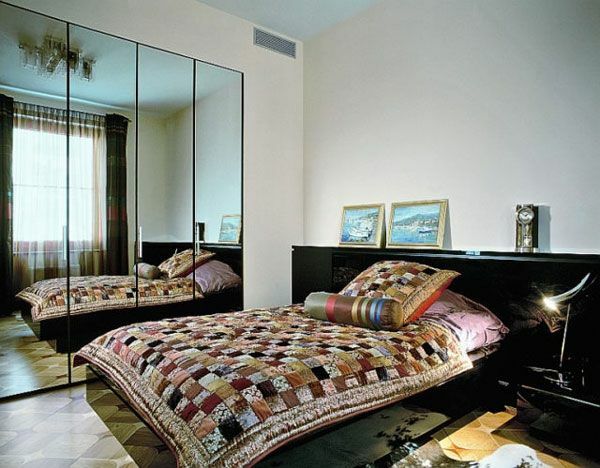 Mirrors and draperies visually expand the space. Designers did not hide a large window behind the curtains. So the tiny bedroom seems a bit more spacious. The original detail - a chair that looks like a clover leaf - is animated by a discreet interior. Ethnic motifs in the decoration of the room. Mirrors are always relevant. 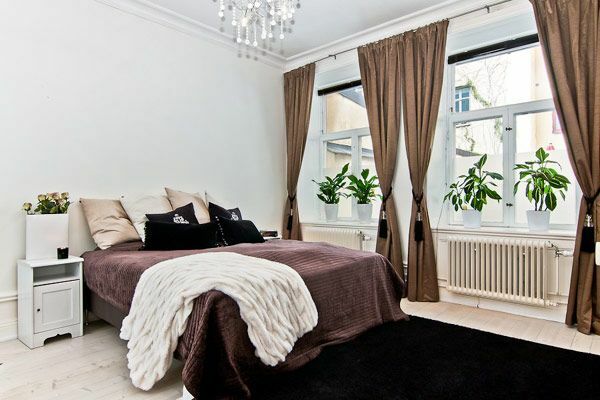 Very elegant and romantic bedroom for a young dreamer. Unusual solution. 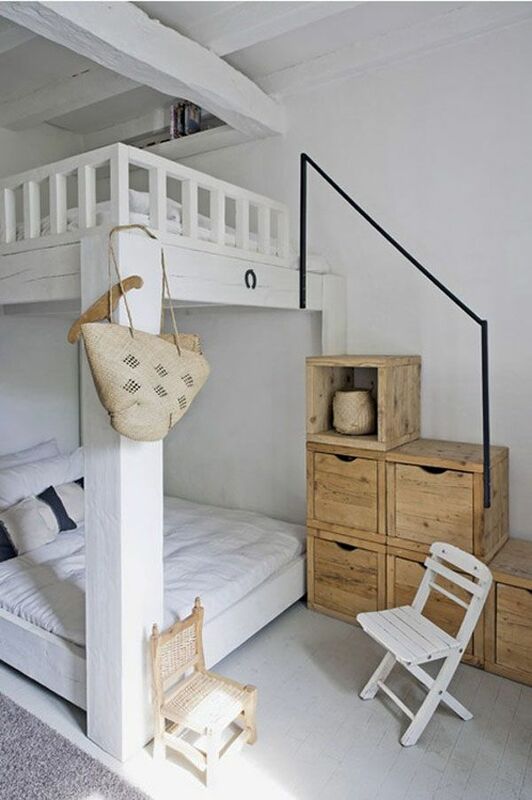 Lockers become the stairs leading to the second tier of the bed. Exquisite interior in French style. Harmonious combination of colors. Attention to detail. A floral ornament on the wall, a hanger in the form of a tree silhouette, an original floor lamp – everything seems to take us to the magic forest. I hope we woke up your imagination and gave food for thought. Dare! You will succeed.